Edible Education at Evergreen is a whole new experience now that we have an established classroom kitchen space and an oven. Specifically, the experience is round, crusty, sometimes sweet and sometimes savory... It's all about the PIE in here these days! 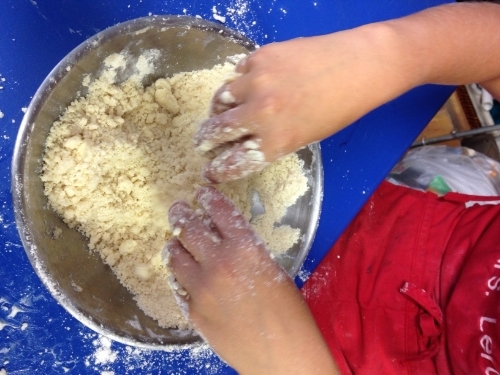 On our first day together, we explored how flour, butter, salt and water can come together to form the perfect flaky pie crust, or the perfect pasty play dough, depending on a few very important factors. On week two we dove into a huge pile of apples, picked just the day before down in Henderson county. These fresh apple varieties all had different flavors and textures and students blended them together to create their very own perfect apple filling. 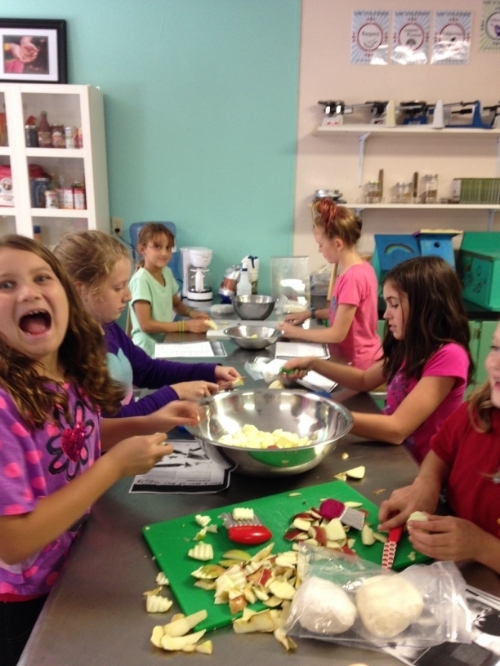 We learned that it takes some special knife skills and a lot of practice to slice, peel, and core apples. But, we worked together and got it done. And then came the task of learning how to roll our the dough, filling it, cutting it and pinching the edges. Again, harder than it looks! But, here they are! 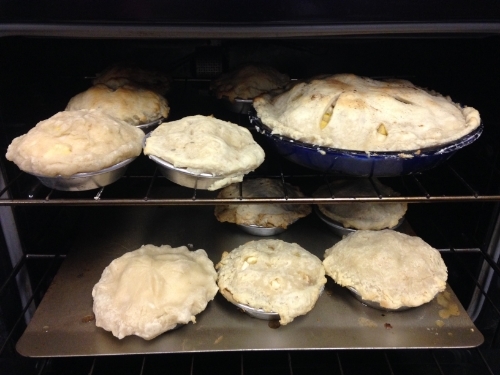 An oven filled with delicious apple pies ready for baking...a bit imperfect in presentation, perhaps, but not bad for a first try at it. I was quite proud of these pie makers. Pie making is tricky business! Week three began with a lesson about how to use a food processor to "cheat" and make a homemade pie crust REALLY fast (and delicious). We made a savory tart crust, with a bit of cornmeal and an egg, rather than milk or water. While the crusts were chilling, I presented the kids with the challenge...we were going to make CSA Pies! We had just received our CSA box from Terra Preta farms and the challenge was to create pies using just these ingredients. So, we sauteed and caramelized and roasted to prepare our ingredients: oven roasted eggplant, sweet potato, and zucchini, caramelized onion, garlic sauteed greens, with a sprinkling of cheese of course. And, oh yeah, how about those eggs! 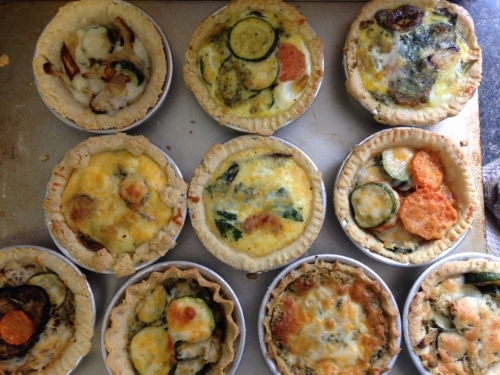 A few kids made quiches. Look at these beauties! 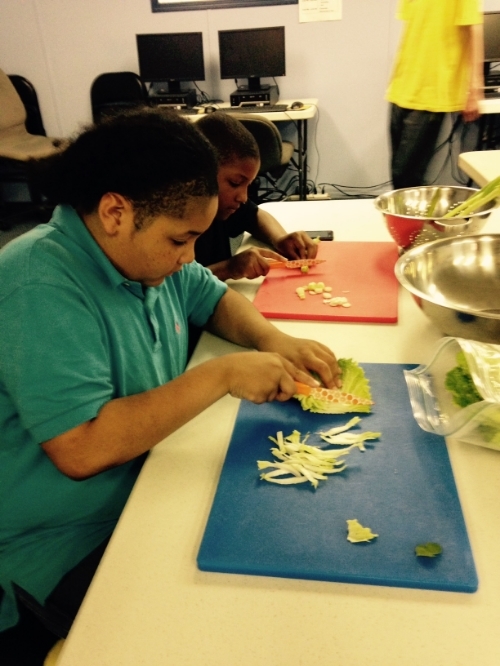 Students gobbled up their pies with a side of salad greens tossed in olive oil and lemon juice. Afternoon snack doesn't get much better than this. 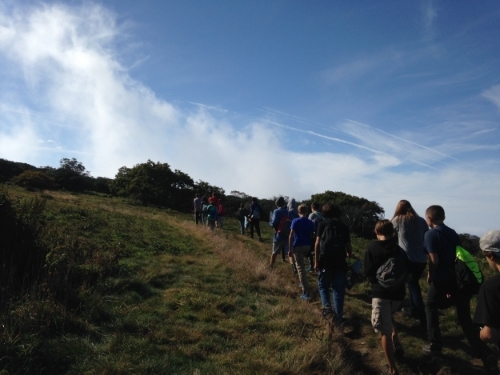 This week Evergreen 8th graders begin their very own Appalachian Journey. This is a learning adventure unlike any other here at Evergreen, one that is equal parts expansive and grounding in its experience. This first expedition of the year weaves together all of the academic disciplines, and many of the enrichments, creating a tapestry of learning that enriches the mind, the spirit and the pallet. 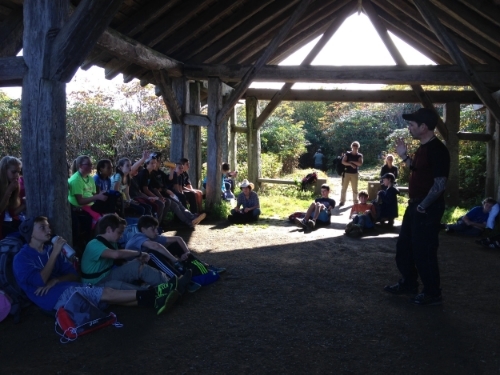 This past Tuesday, we began the 2015 Appalachian Journey expedition kick off with a hike, storytelling and silent reflection at Craggy Gardens along the Blue Ridge Parkway. Craggy Gardens offers 360 degree views of the mountains which allows an opportunity to really take in the landscape- to set the stage- as you will, for where our Journey takes place. It is here that we begin telling the story about how these mountains were formed and how natural and human forces have shaped them over time. Understanding the unique topography and ecology of this place sets us up to better comprehend the lives of the Native American who lived in harmony with this landscape, as well as the lives of the European settlers who came after them, rooting themselves into the hollers and valleys, and who called this place home. Students were asked to consider the resources, knowledge, and tools they would need to be successful as a settler in this region. Alone with their notebooks, they recorded their thoughts, as well as sensory observations from their experience of being alone in this place. Upon returning to school, students were welcomed by a spread of amazing food. 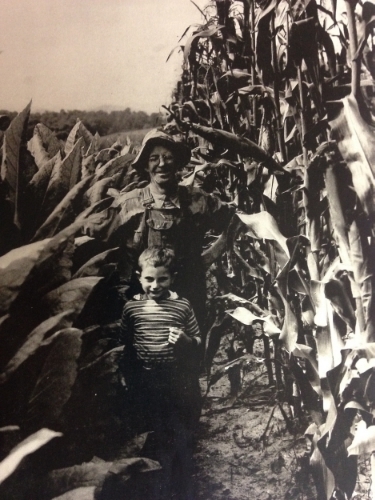 This was no ordinary potluck- it was a FAMILY FOOD HISTORY potluck! 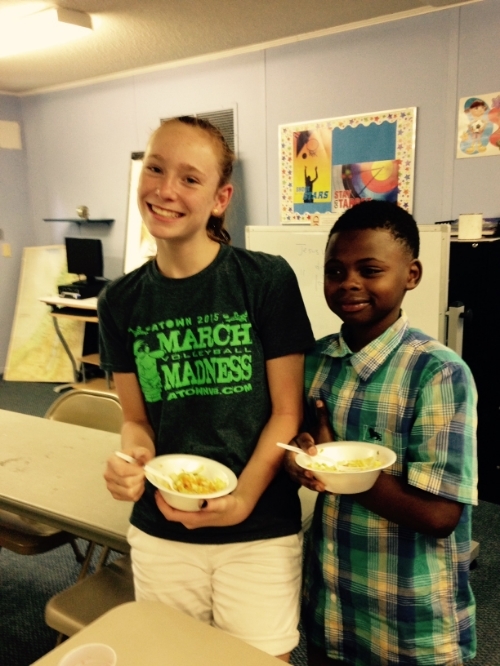 Students were asked to prepare/bring a dish that told a story about themselves or their family. The dishes were prepared by the students (thanks for your help parents!) and accompanied by a six word memoir. After dishing up plates of AMAZING food, students sat together, family style, and shared their food stories. This experience was created to make the connection between the importance of food as a pathway to understanding culture. It is true for cultures around the world that in the kitchen or around the table is where we can most often authentically and a naturally share our stories. The table is a unifying place and eating is a unifying experience. It is through the experience of oral history and food pathways that our 8th graders will explore more deeply the culture and traditions of early and emerging Appalachia. The 2015 Appalachian Journey Food Storybank Project gives our students an opportunity to meet, interview and deeply consider the lives of people in our community who have a lived rooted in this landscape. We will interview, transcribe then write biographies of the people we meet. Then, we will share these stories with our participants, their families and the North Carolina Cultural Resources Western office. Along the way, we will continue to reach into our community to meet amazing folks like Sara Lynch, who wrapped up our kick off beautifully, sharing traditional Appalachian ballads sung and played on the dulcimer. Sarah introduced us to the complexities of the mining and forestry industries of early 1900's and how people shared their experiences of hardship, love for this land and political activism through music. Thank you Sarah for sharing your voice, your music and your stories! Thank you students for participating so fully in this experience...welcome to your Appalachian Journey! The true need for a connection with the natural world is unknown until nature is taken from you. On April 18th, 2014 I had sever brain surgery, recovering has been an extremely long road but I am a stronger person because of it. 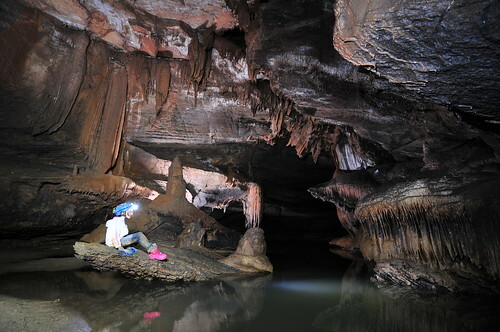 A few weeks ago my class and I went on a three day camping, rafting, and caving trip. I struggled with keeping up in the cave and the strength to row in the raft, but I made it! Nature is exhilarating and fantastic. I feel that I would be a completely different person after the surgery if I hadn't had the support of loved ones and the beauty of the Hot Spring days, the warm summer night, snowy-white winter mornings, and crisp fall evenings. The Seventh Grade just came home from an awesome trip to Erwin Tennessee for our end of the year trip. We had a great time cleaning up the Cherokee trail, Caving, and Rafting on the Nolichucky. We caught a ring neck water snake that was harmless but the teachers said we had to let it go. I had a great time and hope to go back to the same campsite and stay a couple nights there next time. It was a awesome trip!!! A special thanks to Tony Mele, Dan Musslin, Abby Crahan, Katie Smith, Karen Lechner, Lynn Player, David Ramsey, and Terry Gibbs-Barger for there support and guidance. This week we wrapped up our year long community outreach tutoring experience at St. Paul Missionary Baptist Church in West Asheville. 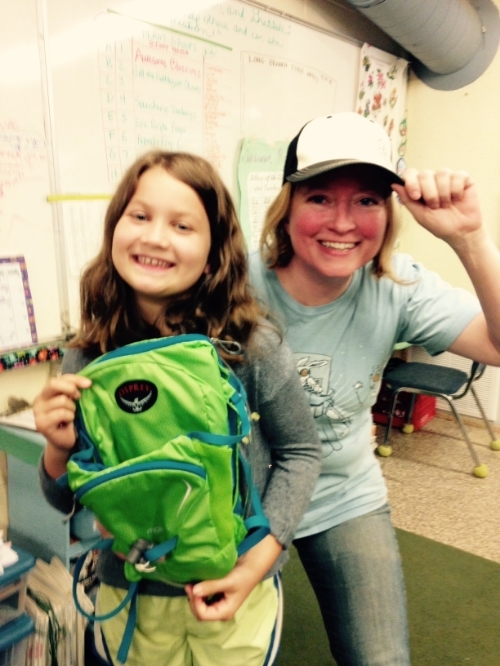 Evergreen first grade Academic Support Teacher, Cathe Bradshaw, worked alongside HELP Program Coordinator, Ms. Zanie Davidison, to tutor 6-10 students every Tuesday and Thursday throughout the 2014-15 school year. 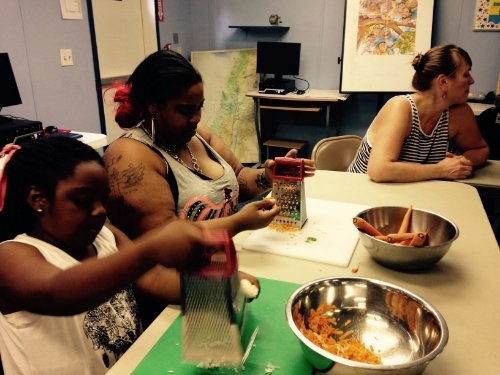 In addition to tutoring support, Marin Leroy Evergreen's EE Coordinator, provided a healthy snack for every session, giving the students an added boost of after-school nutrition as well as opportunities to try new foods. The students benefited from the extra homework help, and above all, they enjoyed the variety of fresh fruits and vegetables Cathe brought and were eager to try new things whenever they were offered. The partnership was very successful. We would like to thank the Rolander Foundation for helping to make this experience possible, as well as Ms. Zanie Davidson for her openness to bringing Cathe on board to work with her in her special community space. To celebrate Cathe's last tutoring session and the end of the school year, Marin brought Evergreen's Field to Feast class to the church. 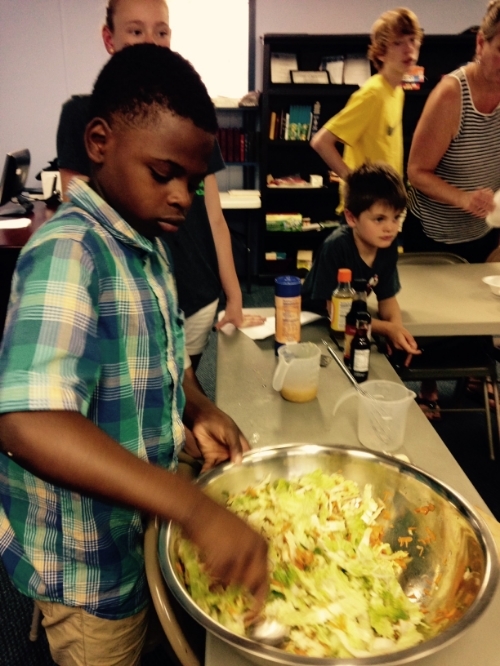 Using foods donated by FEAST and Evergreen's new partner farm, Terra Preta, we prepared an Asian Cabbage salad. Everyone enjoyed learning about the different ingredients and LOVED cooking together. When it was complete, we feasted and enjoyed one another's company. Join us for the Name that Plant Challenge! As part of their Ecology studies, 8th Graders are studying 11 common native forest tree species as a way of "erasing the green blur" . 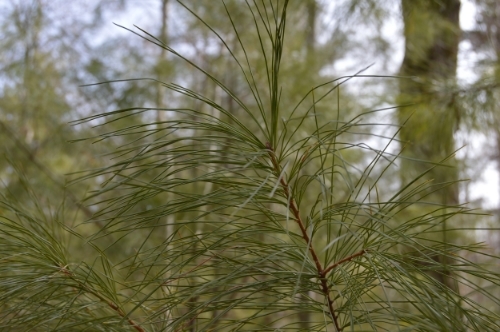 Learn to recognize shapes and patterns and the GREEN BLUR will reveal itself as a plant community of distinct individuals living together in an intricate ecological system. Take the challenge next Wednesday, May 20th in the Science Lab. The 3rd grade are ALL winners in my book. Taking this quiz was a challenge by choice activity, and more than half the class accepted the challenge.These kids ROCKED this! They studied hard and it showed. Six students earned 100% on the quiz, with two students who went above and beyond to include latin names. 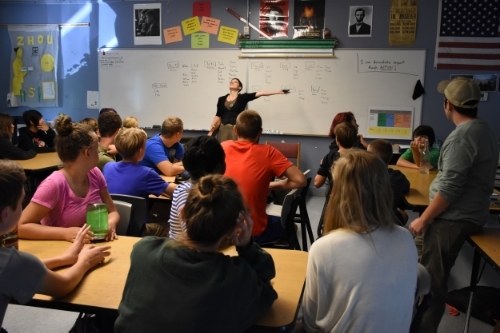 It was a tough call, but the Wild South prize went to Hannah Rosenfelt for going above and beyond AND for inspiring her fellow classmates to the same. Hannah displayed tenacity in her pursuit of this knowledge. She not only knew all 11 plants, but correctly included one latin name (spelled correctly) AND wrote one identifying characteristic about each plant species. Nice work Hannah! Awesome job 3rd grade! In the teacher category, Ms. Deidre took the prize with 100% on the quiz, followed closely by Cat Fletcher and Fynn Crooks. Thanks for participating, teachers! Thanks to Wild South and North Carolina Outward Bound for providing our awesome prizes. We appreciate your support! "The care of the earth is our most ancient and most worthy, and after all our most pleasing responsibility. To cherish what remains of it and faster our renewal is our only hope,” Wendell Berry. This means to keep the world clean and healthy because it is our only responsibility worth living for. Thanks to Joe Hallock and his Solar Powered Sound system, Evergreen sixth graders continue their journey through space and time to better understand how energy from the sun can become usable energy to power everyday household electrical needs. Sixth graders learned about all the working parts on Joe's mobile solar power trailer as the first step towards building our own solar powering station. Can we power our laptop carts with solar energy? Our ipad cart? Our Friday grilled cheese-making? What else can we power from the sun to offset using energy from the grid? Can we build our own solar trailer to power Evergreen's sound system for community events? Thanks, Joe, for inspiring us by sharing your Solar Sound System! Plant Sales - flowers from First Step Farms of WNC, sales benefit the rehabilitation center and all proceeds support Evergreen Environmental Education programs. This day was also made possible due to grant funding support from Greening Forward and donations from individuals through our Piggybackr Campaign. Without this funding it would be impossible to implement the many and various student-designed service projects we are able to complete on Earth Day. Diversity and Inclusion Garden: Kindergarten & 6th Grade worked together to weed, clear and re-plant the large beds bordering our gym. The newly created garden is a "Diversity and Inclusion" garden, conceptualized by 8th graders during a math & EE landscape design project from earlier this year. The "Diversity and Inclusion" garden is a butterfly and bird garden, created with plants that will attract and provide habitat for a diversity of pollinators and other beneficial insects. It symbolizes our design principle of Diversity and Inclusion, exemplifying how the differences in our community make us stronger. 1st Grade Seed Savers: First graders did a workshop with Chris Smith from Sow True Seeds to learn the basics for why and how to save seeds. Students planted three varieties of climbing beans that we will grow in Evergreen's Earth Garden to study, then practice the seed saving we learned in the workshop. First graders also spruced up their backyard garden space with new mulch, a border of bulbs and flowers and four beautiful blueberry bushes. 2nd Grade Campus Stewards: scrubbed out our compost buckets and picked up trash along our forest EL trail. 3rd Grade Garden & Forest Stewards: Third graders worked in their crew groups to complete a number of important projects. Chris's crew built a new bench for the garden. Cat's crew planted our new asparagus bed. Melanie's crew planted a selection of culinary herbs and spring brassicas and cleaned up the hoop house. Deidre's crew worked with Marc Williams to plant wild ginseng, two species of trillium and a spice bush in our forest, adding to the local plant biodiversity of our forest ecosystem. 4th Grade Defenders of the Birds: Fourth graders worked alongside Marc Hopey and group of student volunteers from the Southern Appalachian Raptor Research center to build and install nest boxes on our campus. They added eight new bluebird boxes along our driveway and built a handful of additional boxes to donate to another school in our area. 5th Grade Stream Stewards and Garden Pathway Builders: Fifth graders worked with Riverlink and Asheville Greenworks to do a stream clean up in Haw Creek. They also did the hard and heavy job of moving loads of wood chips up to Evergreen's Earth Garden to spruce up our garden's pathways. 6th Grade Solar Cooker "Bake Off": In addition to assisting their kindergarten buddies with the installation of the new Diversity and Inclusion garden, sixth graders educated others about the power of the sun and how to use it's energy to cook food. As part of sixth grade's energy expedition, they learned all about passive solar technologies and designed and built their own solar cookers which they set up on Earth Day to share with our community. A small group of seventh graders worked with Buzz Durham to build a Haitian Tire Garden, a series of twelve inverted tires, filled with soil and planted out. This project is an extension of the Global Citizenship expedition and presents an example of the resourcefulness and techniques necessary to feed families in areas where food is scarce and soil and seed are valuable commodities. Seventh graders also worked in small groups to help host the community picnic. These kids are the backbone of the Earth Day event, helping to create a fun, playful, learning-filled atmosphere that runs smoothly and engages everyone. Seventh graders facilitate all of our picnic activities (face painting, adopt-a-worm, sack races, touch and feel boxes, seed tag, etc.) and put on our Global Foods Tasting table that highlights foods and flavors from around the world. 8th Grade Campus Stewardship Projects: Traditionally, eighth grades have been charged with proposing solutions to stormwater management issues they observe around our campus as an extension of their Stormwater Studies expedition. This year these projects included: clearing out our bioswales and rain gardens, planting six new fruit trees along the field, planting 10 new forest tree species to stabilize the hillside behind the gym, forest EL trail clean up, fixing drainage problem in the garden, and clearing the garden fence line to increase light and decrease weeds in our garden. Our Earth Day event culminated with a community wide picnic where our community enjoyed games and music, as well as a presentation of the Wild South Nature Writer awards, acknowledging students who use their voice to advocate for the enjoyment and preservation of wild places. Thank you to all of our partners for helping make this amazing day happen. Spring has arrived and the garden becomes, once again, a classroom and teacher. Seeds that are sown, germinate and grow. Perennials that lay dormant for the winter begin a new year of growth. In a matter of weeks, the space transforms from a well hunkered-down series of beds, all tucked in with straw for their winters nap, to a place thriving with growth, providing habitat for all kinds of creatures, including little humans, like these ones. 2nd graders spent their Environmental Education class this week looking for evidence of life cycles in the garden. Thanks to the abundance of plant life, from the spring green pea sprouts to the nooks and crannies of the trees and shrubs, there was much to explore and lots of evidence was found. ...thank our amazing teachers for designing creative curriculum that includes time and space for learning adventures that use our outdoor learning laboratories as classrooms and teachers. ...appreciate our students for their unending curiosity and appetite for adventure. Seeing the world through their eyes brings wonder and grace to my life daily. ...celebrate our partners, especially Sow True Seeds, for their ongoing support of the building of our Earth Garden as a thriving life laboratory where we can all teach, learn and feel our strong, and absolute connection to nature through food and the beauty and biodiversity of a garden. A big shout out of thanks to all of you who have supported our "Selling Seeds not Candy" campaign - it has been a huge success so far! By purchasing your seeds this season from Sow True Seeds and using our GrowEvergreen2015 code, Evergreen receives 30% of the purchase. There's still about ONE MONTH left and it's still a great time to purchase mid-summer season seeds like corn, beans, squash, okra, etc. Last Friday our seventh grades took their science and math classes outside in Evergreen's Peace Garden. Community partners Buzz Durham, Price Hulin and Bob Anderson helped us to better understand the resourcefulness and hard work many people must employ all around the world to grow food and access clean water to support their daily nutritional needs. Students learned to make biochar and how it is used to enhance the nutrients of soil. They flipped old tires to make container gardens, then mixed soil (native soil + compost+ sand + biochar) to fill the containers. Students built raised beds, cleared the garden of debris and prepared potatoes for planting. "Today was a lesson in what it takes to use what you have to survive in a resourceful way. To be a Global Citizen you must your knowledge to selflessly help people around the world. I feel that today's skills are very useful to know even for our own homes. Another lesson of today was recognizing the great privilege we have. I was surprised how much you can accomplish with some tires, cardboard, mulch, corn and an old melee oil drum." Thanks to these AWESOME community partners, Price (check out Price's farm at Terra Preta Farm), Bob and Buzz! And to these incredible parent volunteers, thank you! A small group of fifth grade Student Supported Agriculture leaders have been working diligently through the snow, ice and rain to nurture our first Evergreen Peace Garden entrepreneurial adventure. These determined kiddos have worked hard every day at recess to plant seeds, water them and manage our hoop house to keep things warm and dry. Check out these DIY seed warming tables two of our awesome parent volunteers built. They've worked beautifully! Their hard work has paid off! Little sprouts have grown into sturdy plant starts and tomorrow we'll sell our first batch of plant starts back to Sow True Seeds for them to sell at The Organic Growers School this weekend. Thank you Sow True Seeds for this AWESOME opportunity! And, thank you to these amazing students for their hard work and careful attention. To purchase plant starts from Sow True Seeds, follow the link to their website to find out their selling locations or visit their store at 146 Church Street in downtown Asheville. Since I am creating a blog about animal rights, the first question I have to answer is: "why should people care about animal rights? " The answer is simple. Other animals are intelligent, emotional beings who deserve our respect. As anyone who lives with companion animals would know, they are capable of feeling pleasure and pain like us. Despite this, other animals have long been abused, mistreated, and in general been viewed as somehow “less” than us. This supremacist attitude is the same one that was used to justify the exploitation of blacks, American Indians, Jews, and virtually every other group that has been discriminated against. Humans may be the most intellectually advanced species on the planet, but that does not give us the right to view other species as our property. Intellect should not be used as a measure of the worth of a sentient being's life. As the philosopher Jeremy Bentham said, "The question is not 'Can they reason?' nor, 'Can they talk?' but rather, 'Can they suffer?' "
Our civilization has created rules, the rules of morality, that specify how we should treat each other. These rules are not built into nature, we created them because we had the ability to empathize with the suffering of others and wanted to create a world where every person would have the opportunity to lead a full and happy life. Why should these rules not apply to other animals as well? Most people do not want to see another human, a cat, or a dog suffer. And yet we buy products made on factory farms where animals face a life of constant and horrible abuse. We buy cosmetics which were tested on animals who are subject to constant torture in laboratories. We go to circuses and buy movies in which animals were abused for our entertainment. We exterminate “pests” without a thought for their lives and the value they hold. Animal rights is about creating a better world for all beings where everyone has a chance to be happy. "What PETA REALLY Stands For." PETA. PETA, n.d. Web. 9 Feb. 2015. Bentham, Jeremy. "Jeremy Bentham Quote." BrainyQuote. Xplore, n.d. Web. 11 Feb. 2015. Bentham, Jeremy, An Introduction to the Principles of Morals and Legislation. 1907. Library of Economics and Liberty. 11 February 2015. <http://www.econlib.org/library/Bentham/bnthPML18.html>.